【High Quality and Strong Adhesive】- Door draft excluder made of durable silicone rubber with longer service life than typical foam tapes. Excellent flexibility and resilience make installation easier and smoother. Door draft stopper featured with strong self-adhesive backing - no glue is needed, gives your doors and windows long time sealing protection! 【Perfect Seal Strip】- Each weather stripping is approx. 19.7FT/ 6M in Length, 0.35IN/ 9MM in Width, 0.24IN/6MM(compressed 0.12IN/3MM) in Depth. The weather seal can be cut to different sizes according to your need, can be used in all kinds of sliding window, door, security door, closet door and etc. 【Multi-functional Draught Excluders】- Multi-hole & D Type design of door strip reduce noisy effectively, good for anti-collision, windproof, dustproof, weather proof, draft stopper and energy-saving, which give you a quiet and comfortable living environment. Very harsh winter snow, blizzards, cold is coming, yet the new seal has stood up to it and DEFINITELY been worth buying!!! 【Widely Applications】- Rubber seal strip are widely used in a variety of sliding windows, sliding doors, security doors, cabinet doors, cupboards, car, can also be used as a refrigerator / freezer door gasket, or you can use your imagination for where you need it, such as in bathroom, washing room and etc. 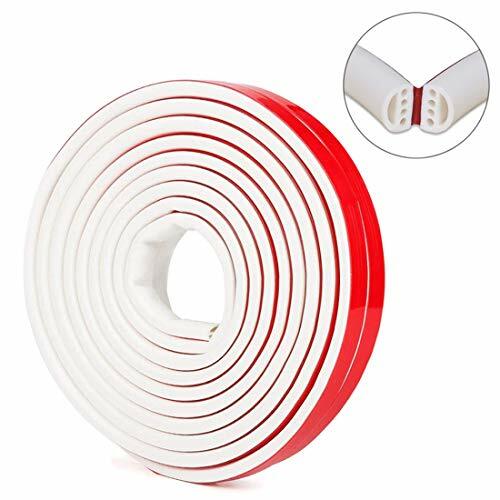 【Save Your Money and Time】 100% Satisfaction Money Back Guarantee---If you have any questions with our door/window draught excluder please contact us, our friendly customer service team will work hard to put a smile back on your face.